when i received a text from my BIG BOSS in QEH2, offering me to transfer to new hospital, i asked him for a day to think about the offer. i've been working in psycho-geriatric department for 2 years now. "eiii, kerja sama orang gila, you'll get infected if you're working there too long"
well, i've known so many people who've been working in psychiatric department for the rest of their life and they are doing just fine now. so, yeah, it's just a stigma. now back to the offer that i received, the first person i ask for an opinion is mr.J. and as expected he didn't agree because he know that i like psychiatric department. "you like it in a psychiatric department. it's fun and relax there. i don't see any point why you should transfer"
"hongo hongo nopo diah, yang penting bahagia(up to you, as long as you're happy)"
yeah, i love u ma and pa.
i also ask my friends in our whatsapp group and some of them said i should transfer of course, but most of them said that it was totally up to me. so, there i was, thinking the whole night. when i started working as Assistant Medical Officer, honestly i don't have any specific field that i like. i just keep on working. i was working/ doing my attachment in emergency department for 8 months (all the AMO are required to work in emergency department before we officially start working in other department) before and then i was sent to psychiatric hospital in the end of 2012.
i was placed in psycho-geriatric ward and immediately fell in love with the patient there. they are old but adorable and funny most of them time. it's 'most of the time' because there are times when their illness relapse and you know. psychiatric problem. and of course the staff there are the best. they are as fun as any other workmate that you met in other place. i miss going to ward at night just to eat with them. early this year i've decided to live my life to the fullest, do whatever things that i am afraid to do. getting out from my comfort zone. try various kind of food and things. so why not try for new work experience? i think 2 years in psychiatric department is enough for my psychiatric experiences. time to experience the new environment, new workmate, new workload, meeting new people and new friends. today is my fifth day working in QEH2. my boss placed me in PPP management unit and it's actually disappointed me a bit since i am imagining something extreme like cardiology department or orthopedic department where i can gain more exciting experience kenen but it's okay, i'll take this as a chance to learn something new in management field. and emm.. if you happen to know Joseph Kajangan, well, he's actually my new boss. Same! I was transferred to a new department after been working for 1 year at gynae onco dept. Mula2 btul2 I dont want to transfer since for me transferring to a new place means you had to learn again about the management , make some new workmate, adapting to new surrounding which is Im not really good at all these things. We're facing the same thing since my new workplace is kind of bored me becoz I like something challenging like dealing with patient. Sni tmpt baru you have to keep the distance since the patient is a radiation patient. -_- but sokayyy, I can go through this. We can go through this. Fighting! jyeaaahhh, we can we can!! fighting! 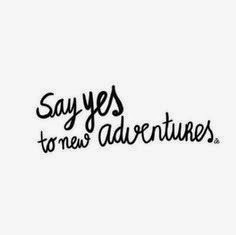 Say yes to new adventure! Thumbs up! Never regret, God knows what best for you. got already bah DiGi 4G LTE in KK!